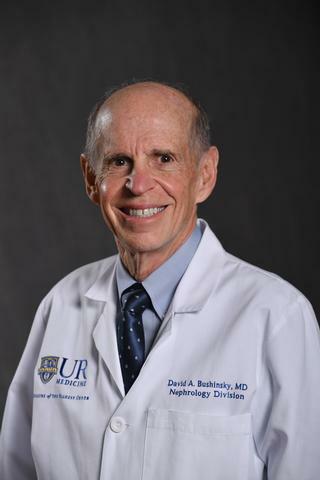 David A. Bushinsky, M.D., is a Professor of Medicine and of Pharmacology and Physiology at the University of Rochester School of Medicine. He is Chief of the Nephrology Unit at Strong Memorial Hospital and Associate Chair for Academic Affairs in the Department of Medicine. Dr. Bushinsky has published over 100 peer-reviewed articles and over 60 invited reviews, chapters and editorials focusing on disorders of divalent ion metabolism. His has developed a strain of rats that exhibit genetic hypercalciuria, the most common metabolic abnormality in humans with nephrlithiasis, and spontaneously form kidney stones. The pathophysiolgy of the hypercalciuria closely parallels that of man and is thus a useful model to study stone formation in humans. He has also extensively studied the mechanism by which acid induces physicochemical bone dissolution and cell-mediated resorption. Dr. Bushinsky has lectured throughout the world on stone formation, effects of acid on bone and other disorders of divalent ion metabolism. Dr. Bushinsky received his medical degree from Tufts University School of Medicine in Boston, Mass. He completed an internship and residency at Tufts New England Medical Center Hospital in Boston, Mass. He also completed a fellowship in clinical nephrology and a research fellowship in nephrology at Tufts New England Medical Center Hospital in Boston, Mass. Bushinsky DA, Chertow GM, Cheng S, Deng H, Kopyt N, Martin KJ, Rastogi A, Ureña-Torres P, Vervloet M, Block GA. "One-year safety and efficacy of intravenous etelcalcetide in patients on hemodialysis with secondary hyperparathyroidism." Nephrology, dialysis, transplantation : official publication of the European Dialysis and Transplant Association - European Renal Association.. 2019 Mar 11; Epub 2019 Mar 11. Wesson DE, Mathur V, Tangri N, Stasiv Y, Parsell D, Li E, Klaerner G, Bushinsky DA. "Veverimer versus placebo in patients with metabolic acidosis associated with chronic kidney disease: a multicentre, randomised, double-blind, controlled, phase 3 trial." Lancet.. 2019 Mar 8; Epub 2019 Mar 08. Krieger NS, Grynpas M, VandenEynde A, Asplin JR, Frick KK, Kim MH, Ramos FM, Granja I, Bushinsky DA. "Low Sodium Diet Decreases Stone Formation in Genetic Hypercalciuric Stone-Forming Rats." Nephron.. 2019 Feb 6; :1-11. Epub 2019 Feb 06. Book Title: Acidosis and Bone. In: Nutritional Influences on Bone Health. Edited By: P. Burckhardt, Bess Dawson-Hughes, C, Weaver. Author List: Bushinsky, D. A.